These undated combo booking photos obtained February 11, 2019 courtesy of Leon County Sheriff's Office shows suspects Brian Williams(L) and Denise Williams. - He killed his best friend to marry his wife, making it look like a duck-hunting accident. She was in on the plot and collected nearly $2.0 million in insurance money. They didn't live happily ever. But it took nearly 20 years to put them behind bars. 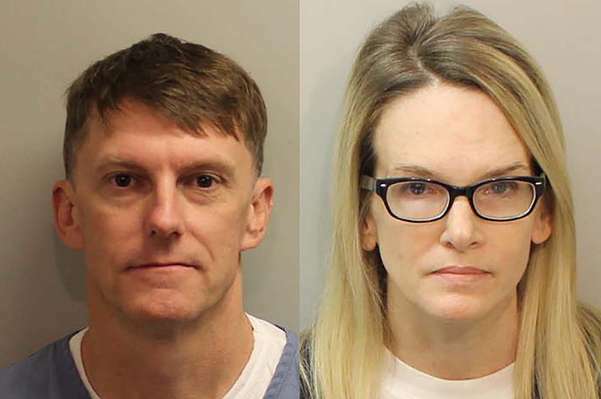 Denise Williams, 48, was sentenced to life in prison this week by a Florida judge for the December 16, 2000 murder of her husband, Mike Williams, a real estate appraiser. It was her lover, Brian Winchester, 48, Mike Williams' best friend and murderer, who testified against her and sent her to prison. The sentencing was the culmination of a quest by Mike Williams' mother, Cheryl, to discover what happened to her 31-year-old son. Cheryl Williams never bought the official explanation that her son had gone duck hunting on Lake Seminole, fallen out of his boat and been eaten by alligators. (Photo by HO / Leon County Sheriff's Office / AFP) / RESTRICTED TO EDITORIAL USE - MANDATORY CREDIT "AFP PHOTO / LEON COUNTY SHERIFF'S OFFICE" - NO MARKETING NO ADVERTISING CAMPAIGNS - DISTRIBUTED AS A SERVICE TO CLIENTS / TO GO WITH AFP STORY BY CHRIS LEFKOW -"Nearly two decades later, Florida murder scheme unravels"